Today’s cyber security professionals are challenged to respond to an increasing number of inside and outside threats – and compliance requirements – on a tight budget. In an attempt to overcome this challenge, many have added new tools, resources and technology which has in turn exacerbated the problem. 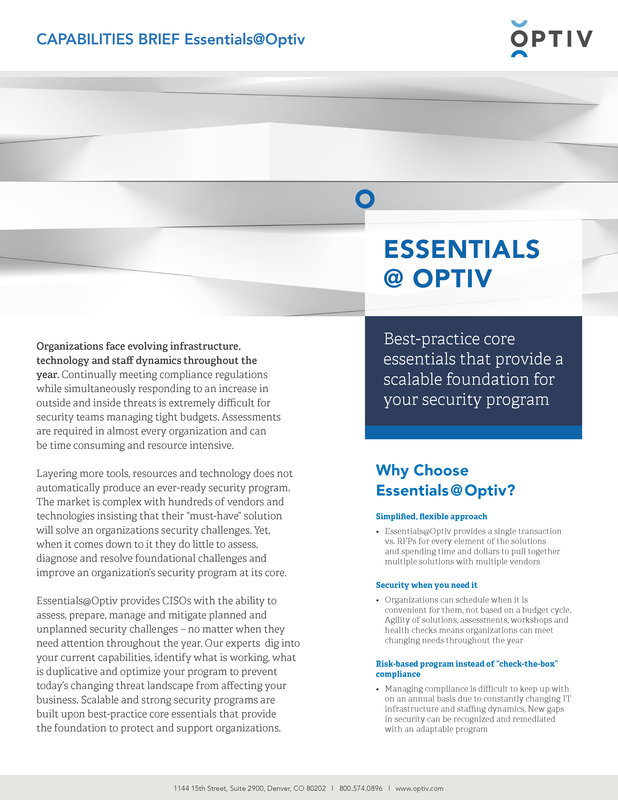 Essentials@Optiv was created to provide CISOs with the ability to evaluate, prepare, manage and mitigate planned and unplanned security challenges, no matter when they need attention throughout the year. This comprehensive and customizable solution enables you to assess, diagnose and resolve foundational challenges and strengthen your cyber security program at its core – and within your budget.